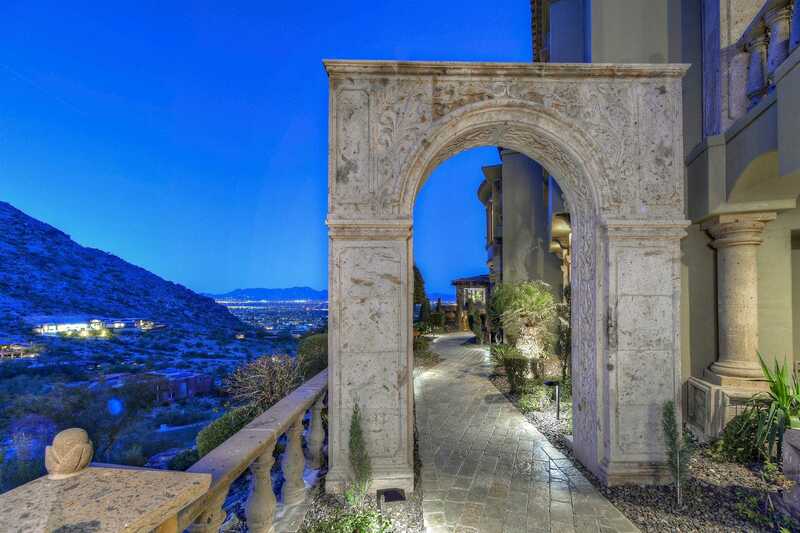 Gorgeous views, exquisite ornate details, masterfully designed, and expertly crafted, this grand guard-gated estate exudes elegance. Thoughtfully positioned on a large, private, and quiet hillside lot, the home blends beautifully with the mountain terrain, and offers breathtaking views from its elevated position on Mummy Mountain. The home showcases exceptional craftsmanship, materials, and design. Marble and wood floors, custom millwork, coffered ceilings, fine marble countertops, French doors, and 8 gorgeous fireplaces, flawlessly create an ambiance of beauty and quality. Whether hosting a black tie event, or enjoying a small intimate gathering, all will be touched by this truly extraordinary estate. Directions: Please proceed W on Quartz Mountian Road until you reach the guardhouse. Guard will provide directions. Approximate size: 76230.00 sq. ft.